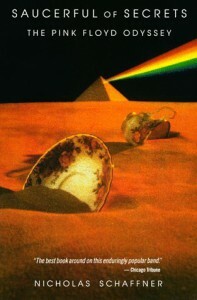 A Saucerful of Secrets: The Pink Floyd Odyssey, Nicholas Schaffner, Delta, 1992, ISBN 978-0385306843, 348pp. The recent demise of Pink Floyd keyboardist Rick Wright was my impetus for reading this well-researched biography of the rock group. I’m a fan of the Roger Waters/David Gilmour version of Pink Floyd (as opposed to the Syd Barrett version or the Waters-less version), and Schaffner does a great job of distinguishing these different periods of the band, putting a nice perspective on the way the transitions occurred given the personalities involved. It’s interesting to note that Floyd was unlike many other rock groups at the time, having grown up middle-class (or, in the case of Wright, upper-class), which partly explains their sound, which relied less on the three-chord blues imported from American (with which groups such as the Who and the Rolling Stones modified in their own ways to make popular both in Britain and back in the States) and more on experimentation, especially with sound effects. In fact, I hadn’t realized just how important sound effects were to the Floyd sound until having this pointed out to me by Schaffner. I probably found the discussion regarding Syd Barrett the least interesting thing here, but that’s due to my personal distaste of the psychedlic-style that was his hallmark. Others who like Barrett’s music will likely find much to discover herein about Barrett, how both fame and constant LSD use took its toll on him, and how he was eventually ousted from the group that he ostensibly was the leader of. Of the other major change–the revival of the Floyd name sans Roger Waters–I was much more intrigued and found that Schaffner had done a good job in helping me see both sides of the issue. Personally, I think that Roger Waters and David Gilmour are like John Lennon/Paul McCartney: while both are good songwriters solo, they were great songwriters when they wrote together. Waters tends to be much, much too wordy in his solo material, neglecting the music and sometimes even the sound of the words, while Gilmour’s lyrics are painfully juvenile at times (I never thought I would hear “glove” rhymed with “love” in a Pink Floyd song). Previous: Sandman: Fables and Recollections, Neil Gaiman et al.